A HUGE shout-out to these sponsors of last year's 100th Meridian EdCamp. Thank you to these sponsors for helping make our EdCamp a successful endeavor! SeeSaw lets students easily create digital portfolios that can be shared with teachers and parents. It’s free for teachers and students, and has a free and paid version for parents. SeeSaw will increase student and parent engagement and make work flow easier for your class. Thank you to @seesaw for sponsoring our EdCamp. ​​Kidblog provides teachers with the tools to help students publish their writing safely online. Kidblog gives students' writing a meaningful purpose and an authentic audience. Kidblog is a great tool for the K-12 classroom. To learn more, visit their website at ​https://kidblog.org/home/. 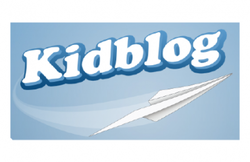 Thank you to KidBlog for supporting the 100th Meridian EdCamp! A BIG shout out to Cozad Development Corporation (CDC) and Robyn Geiser for providing rolls and coffee for our attendees. Also for helping organize our day and lunch! ABCYA.com is a teacher-created website which provides fun and educational games and apps focused on children, parents and teachers. Thank you to @ABCyaGames for providing swag for our EdCamp attendees! Big Ideas Math is a comprehensive math program developed for the Common Core State Standards that delivers instruction for all students. IPEVO offers schools classroom technology that is powerful, however, affordable. IPEVO specializes in interactive teaching tools such as interactive whiteboard systems and document cameras. IPEVO has been generous in supporting our EdCamp and a couple LUCKY attendees will be taking to their classroom a new iPevo device. Thank you IPEVO!! For more information, visit their website or follow them on Twitter at @ipevo. Striv helps schools share their stories through live streaming, social media, and web presence. Striv is a live video streaming platform build FOR schools. Our school has been a Striv school the past three years and realize how important their services and support are to our district. Not only does Striv offer great products but the education program and support are unbeatable! Striv will be supporting the Cozad 100th Meridian EdCamp with some SWAG and also by attending our EdCamp. Thank you to @taylorsiebert of @StrivTV! For more information, visit their website. THANK YOU to Cozad Community Health Systems who is providing a FREE lunch to ALL our 100th Meridian EdCamp Attendees. Thank you for supporting educators!